Mr. Pappalardo is the state of work moving on schedule as forecast and will the terms of delivery expected by the city be respected? The works are underway and progressing as foreseen. In spring of 2007 The boat births will be delivered in spring 2007. The basic structures of the works have been completed and the big revolving pontoons are finished too. The main structure of the 190 metre long building which will contain all the technical and commercial services is also nearly finished. We are already programming the inauguration which will not be limited to a single day. In fact we intend spreading it over five months, organising special events like regattas, fashion shows dedicated to sea ware, deep sea fishing competitions and so on. The objective is to make the harbour live the programmed festive period, showing clients and the city what this new reality has to offer. Have there been changes to the original plan? We have decided to make room for large yachts in the second marina too, so as to meet the market trend that requires births for yachts ranging from 40 to 60 metres. We will be able to offer more than 100 births for yachts above 24 metres and we'll be the only Italian marina to boast such capacity. As a result, in respect to the original plan, changes had to be made to offer in the water and on shore services which we've dubbed operation "white gloves." The white glove treatment is precisely what we have to offer such high level yacht owners because they expect a qualitative service. Ashore there'll be exclusive one brand boutiques and amongst the general services offered, there'll be a newly conceived and innovative ship chandler service. Other details must not be forgotten such as restaurants, which will reach levels of excellence. A catering service will be on offer in different types of restaurants at international level. A whole city drawn by the glamour of elite yachting will be there to greet the new arrivals and special events will be hosted to promote the city and our resources as a reference point to spend one's free time. The feedback you've had so far indicates that yacht and future yacht owners are numerically more in the elite category or is that not the case? We've had enormous requests for yachts of noticeable dimensions but the encouraging factor also came from the so-called minor yachting categories who are fed up with ranking, in every other port, as second class yachtsmen. In fact after valuating the project and understanding its objectives they felt reassured since they realised that they will also receive a "white gloved" treatment. I would like to stress this point further. All our guests from every sector will receive an excellent service at no extra charge but in line, price wise, with normal standards. In short, every yachtsman that will be a guest of the Genoa Airport Marina will have the pleasure of seeing his own boat amidst magnificent ones and be entitled to the same qualitative services. Are there more requests today for births under or over 15 metres? In respect to a few years ago, the average size has changed. There is no shadow of doubt that in the so called "medium" yachting bracket range, the average size has shifted towards 15 and 18 metres. Another important technical aspect is that in comparison to the past, boats are built much beamier. We had foreseen this trend, as of the project phase, and conceived the marina with wider births in comparison to the average. For example: 14 metre boats will have in width a 4.80 metre space, an 18 metre a 5.50 metre space, a 28 metre a 7 metre space and a 45 metre an 11 metre space. What is your reading of future superyachts' demand for births ? It's incredible how the over 45 metre market has grown and is evolving. According to a recent study 100 yachts over 45 metres will be delivered in Europe in 2007. These yachts still do not have a birth place. We are naturally happy about this because we will be in a position to satisfy future demand. How many fuel stations will there be? As a result of the new fiscal law concerning pleasure yachting, duly registered boats for charter over 24 metres, may fuel up duty free. We therefore decided to include a duty free fuel station. These pumps will allow us to serve yachts of over 24 metres which are destined to grow in number, thanks to the aforementioned law. The duty free station is the only one in the whole region of Liguria. We do know of another two pumps but they are logistically placed in an unfortunate position. Another 5 distributors placed on a 110 metre quay will enable us to serve as many yachts contemporarily thus avoiding long queues. These measures are an example of the excellent qualitative service addressed, not only, to the small, medium and big pleasure yachting boats, but also and above all, to the super yacht class. 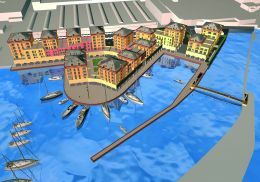 The space allocated to local sport associations will in some way be integrated in the Genoa Airport Marina or will they be detached? The bodies you are referring to are already integrated in the project and for two good reasons: The first is logistical in as much as there are no impeding barriers. The long walk open to the public which starts from the residential borough down to our marina, passing by the associations, will represent in fact a sort of umbilical chord joining the areas perfectly. The other reason is absolutely esthetical and environmental. We have actually reproduced the associations' centres of operations with the same architectural design used in the residential borough. We applied the same criteria the rest of the way down to the harbour. 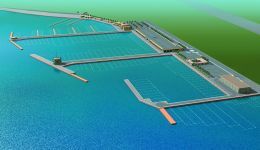 The aim is to give every visitor, or user of our port facilities, the impression that it's all part of the same marina. From a practical point of view the associations' sporting practices will amalgamate very well with our own initiatives to foster the entire area's development and use. Are there any surprises in store for the upcoming inauguration of the marina that you can tell us about? The imprint is to make this marina an all year round nautical attraction and not just as a birthing point for small, medium and large boats. The end result is to magnetize the Piedmont and Lombardy regions which constitute our natural target comprising 60% of the nation's yacht owners. It is important to make them live this marina, with its enormous spaces on land, the relaxing 1,300 slot car park and top nautical supply services, as a focal nautical point of reference throughout the whole year. From whichever port a yacht owner comes from he'll be able to make all kinds of supplies. Technical equipment and Hi-Tech included, thanks to the commercial enterprises at his disposal. Yet the real novelty is to have concentrated on the services that a yacht owner may require which we'll offer him through a hospitality desk. The desk will become a focal point of the marina by servicing the yacht owners needs from identifying who to contact to solve mechanical and technical problems, help in flight and hotel bookings, find labour for the yachts cleaning and maintenance, offer solutions for the organisation of parties, events and catering services on board and so on. 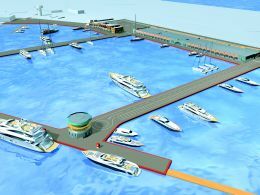 The Genoa Airport Marina's management will give its clients a "white glove" 360° service for 365 days of the year. We are also organising an efficient private service to collect yacht owners and their VIP guests from the airport's runway to their yachts. We want to make them feel already on board as of the moment they'll land on their plane. For further information: Genova, +39 010 6013630; Milano, +39 02 67493202; Torino, +39 011 4378298; web site www.marinagenova.it; e-mail info@marinagenova.it.